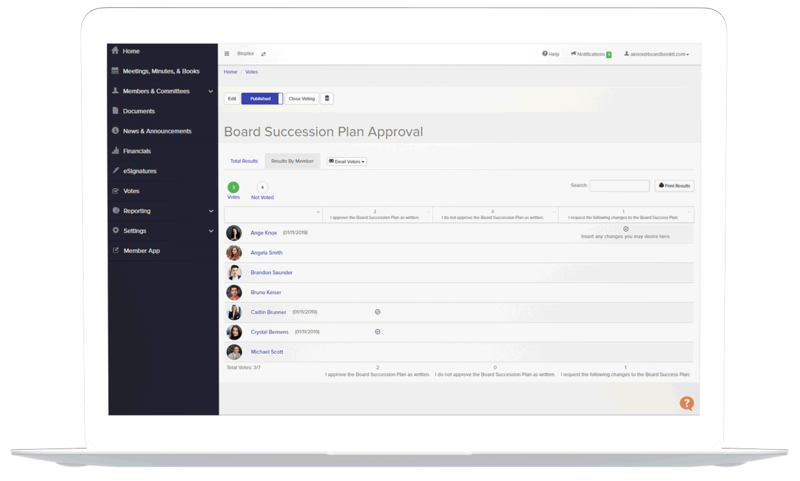 Secure board portal technology that allows boards of directors to gather signatures, get approvals and request votes on pending matters between board meetings. BoardBookit Voting and resolutions is a critical tool for making impactful decisions during and in between regularly scheduled board meetings. Enhanced voting capabilities were designed from collaborative efforts from our customers’ needs. BoardBookit understands unique voting scenarios across diverse industries in order to be flexible enough to manage loan committees, simple polls, Unanimous Written Consent, and many other types of votes. Administrators have the ability to create various ballot options, set security permissions, and adjust results reports from the innovative board portal platform. 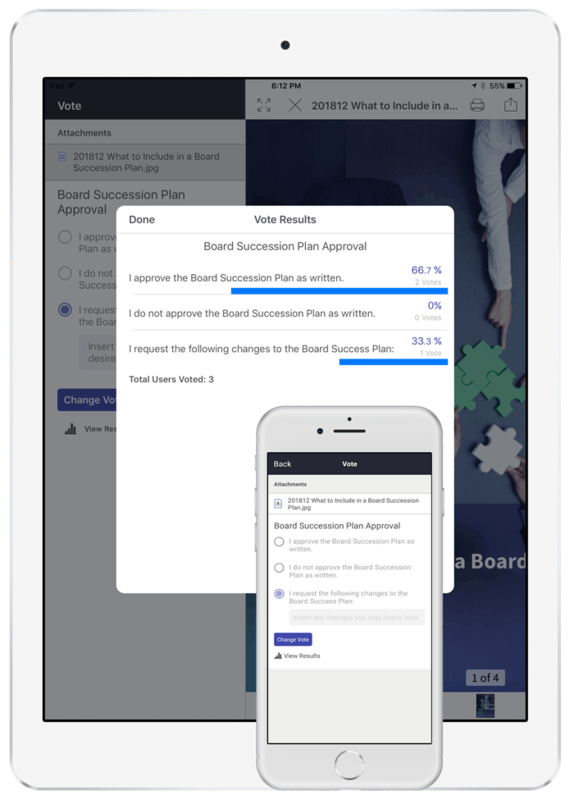 BoardBookit Voting streamlines the decision-making process for board administrators with easy and flexible ballot creation and security permissions. Our exclusive adjustable and comprehensive reporting features allow board administrators to view resolutions in the best way for their organization. BoardBookit Voting allows for 4 different types of ballot creation including checkboxes, radio buttons, text boxes, and paragraph responses. Choose voting populations by individual, committee, or individuals within a committee. For votes that require documentation, administrators have the ability to attach supporting documents to the voting ballot to centralize information and simplify board resolutions. Allow voting members to see results specifically by a member, by count and/or percentage, or restrict members from viewing any results. Archived ballots and results are easily accessible by searching for the ballot name. 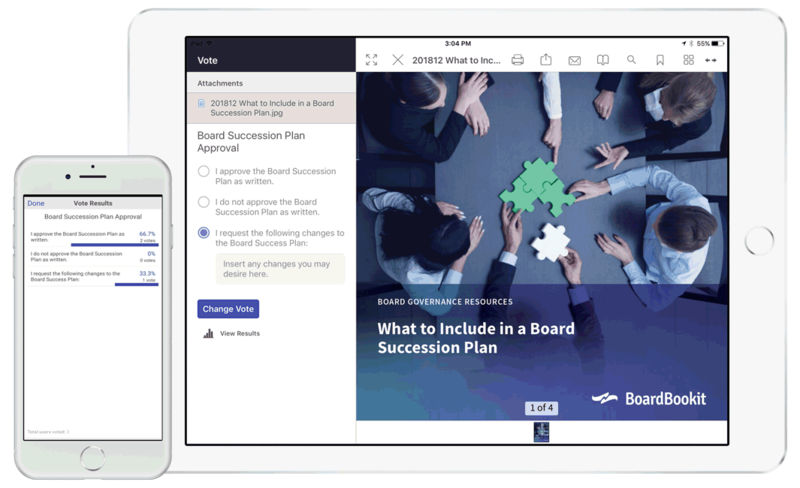 BoardBookit Voting allows for board business resolutions to be made from any device in and out of the boardroom. Flexible voting options, the ability to view supporting documents, and paragraph responses enable seamless decision-making. Voting is easy with checkboxes and radio buttons. Make decisions quickly with a tap of a finger from any device. When voting on board resolutions requires more explanation, text boxes and paragraph options are available for further commentary. Easily view attached supporting documentation when voting requires document approval. Documents are attached directly to the voting ballot to ensure you have the information you need when you need it most. Board members can view voting reports by individual, count, or percentage when enabled by their board administrator. Board decision making is placed at the tips of your fingers in and out of the boardroom. Our full-featured application allows for Voting on the web, iPad, iPhone, and all Android devices. Unlike other systems that charge a license fee per user, BoardBookit offers unlimited users and groups, so you can all work together without the extra costs and distractions. Create and distribute board materials in one central easy-to-use board portal. With a focus on constant innovation and fortified security, BoardBookit makes administering your board easy. Collaborate, clarify, and comment on board agenda items and documents with discussions in real-time integrated within the intuitive and secure BoardBookit platform. Simplify the process of taking, editing, and distributing meeting minutes integrated directly within the secure BoardBookit board portal with robust editing and management features. Quickly toggle between different boards when directors and administrators are members of multiple boards utilizing BoardBookit board management software. ARE YOU READY TO TAKE BOARD RESOLUTIONS & VOTING TO THE NEXT LEVEL? BOARDBOOKIT TODAY!